We promise, subject to the restrictions set out below, that we will be at your door or lobby with your order within the time limit given to you when you place your order. For typical orders the time Guarantee is 40 Minutes, but the guarantee availability and time varies depending on a number of factors. If we are not at your door or lobby within the specified time limit, your order is free (the “Time Guarantee”). In addition to the Time Guarantee, if you are not satisfied with the quality of an item in your order, are missing an item from your order or are delivered the wrong item, we offer one of two resolutions depending on the type of item in issue (the “Satisfaction Guarantee”). 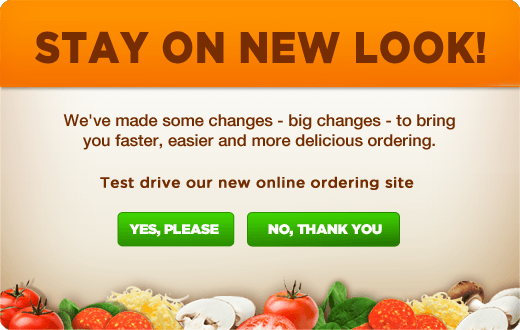 If the item is a large item such as a pizza, chicken, salads or sandwiches, we will replace the item. For smaller items such as dipping sauce, beverages or snack items, we will provide a credit for use on your next order equal to twice the value of the item as stated on Pizza Pizza´s then current menu. The Satisfaction Guarantee applies to orders placed at least one hour before closing (closing times are 2:00 a.m., Sunday to Wednesday and 3:00 a.m. Thursday to Saturday). Orders placed in the last hour of operation may be dealt with the next day and will be resolved by the issuance of a credit. The Time Guarantee is not offered on all orders. For example, larger orders take longer to prepare and cook and therefore will not be guaranteed. You will be informed as to whether or not the guarantee applies at the time you place your order. A customer is not entitled to a Time Guarantee as a result of a Satisfaction Guarantee claim. Pizza Pizza reserves the right to remove any of the guarantees at any time and for any reason whatsoever in its sole discretion including, but not limited to, inclement weather, technical problems or restaurant related issues. Drivers never pay for any resolution under the guarantees. The start and end times of the guarantee will be the current time at Pizza Pizza´s call centre. Pizza Pizza will determine any dispute as to the applicability of a guarantee in its sole discretion. In order to be eligible for one of the guarantees Pizza Pizza must receive a complaint on the day the order is placed, otherwise Pizza Pizza will no longer be obligated to honour the guarantees. A free order means the cost of the entire order, including the cost of the product, applicable taxes and delivery charge. Products which are replaced are not subject to a delivery fee or applicable taxes and are not subject to the Time Guarantee, but will be replaced as soon as is practical. 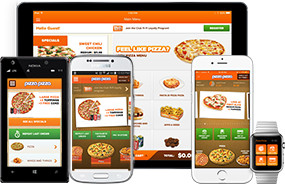 In the event that you are not satisfied with the replacement product, Pizza Pizza may then elect to send another replacement product or grant you a credit equal to the value of the item in question. Any credits given may be used on the next order placed with Pizza Pizza and may not be used on the order resulting in the credit and may not be converted to cash or other consideration. Credits must be used within six months of the date they are granted or they will become null and void and will no longer be available to be used by the customer. In the event that the credit expires, the customer will not be entitled to any further compensation.